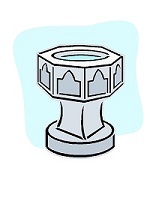 For baptism to take place at St Anne’s it is important that you live in St Anne’s parish or that it is the church you normally attend. Parents need to arrange to meet with the parish priest. At this meeting we have the opportunity to explore why you would like to have your child baptised. The priest will then usually invite you to join with other parents in the next preparation programme. These take place three or four times a year. You are formally welcomed with other parents at the Sunday Mass you normally attend. In two evening sessions we look at the meaning of baptism and the role of parents and godparents. Once the preparation has been completed we are able to arrange a date and time for the Sunday celebration of your child’s baptism. Remember, baptism is a beginning. As parents you have the responsibility and the privilege of helping your child’s faith to develop and mature.